For those of you who have been tagged by a police radar or laser, you know just how annoying it can be to have to bear with the inconvenience of receiving a speeding ticket with a huge fine attached to it. The price to both your psyche and your wallet can be devastating, especially when you realize that receiving that $100 fine could have been avoided if you only had a Radar detector. With the competition for these devices being so stiff, it would not be surprising to find that making the choice between products baffles you. However, after you read about the Cobra ESD 7570 9-Band Performance Radar/Laser Detector, the clouds that have been hanging above your head should clear right up. Cobra ESD7570 9-Band can detect all the frequencies used by law enforcement officials in both the United States and Canada (X, K, Ka, and L bands). 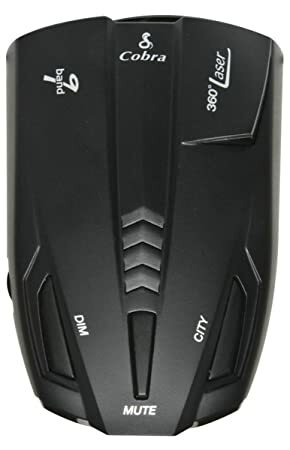 The Cobra ES7570 9-Band is one of the most affordable Radar detectors on the market, and with the number of features you receive you will be surprised at what a bargain this little gadget is. This device is a state of the art radar and laser detector that can detect all the frequencies used by law enforcement officials in both the United States and Canada (X, K, Ka, and L bands). It provides you with 360 degree protection and is able to detect law enforcement radars from as far as ½ a mile away when you are cruising in highway mode (X, K, and Ka bands), giving you plenty of time to prepare for the speed trap ahead. In City mode, the range is about four to five blocks. The two different modes help to reduce on the number of false alarms you may receive, especially in built up areas. The Laser Eye located on the rear top left of the device has a 360 degree detection radius for L (Laser) bands. However, like most laser detectors, the ESD7570 9-Band can only detect these once the laser has been activated. Therefore, by the time the detector has alerted you of its presence it would probably be too late to reduce your speed, unless you are in a line of traffic and the officer is aiming the laser at a car in front of you. It also comes with a handy VG-2 Alert, which lets you know if the police are using radar detector detectors or RDDs. The ESD7570 9-Band is invisible to Spectre I and VG-2 RDDs, so you do not have to worry about anything should you detect one. The Cobra ESD 7570 9-Band comes with an “UltraBright” display that has three settings, dim, faint and brilliant. These settings can be changed using the DIM button on the upper right hand side of the device, and are extremely handy especially when driving at night or during the brightest part of the day. Alerts are delivered visually and audibly, with a bar graph on the display showing you the strength of the signal that it is picking up and audible beep warning you when the device has detected a signal. The beeping can be shut off by pressing the mute button on the top center of the device, and the volume of the beeping can be adjusted using the volume knob on the right side of the detector. It also comes with a safety alert that warns you about emergency vehicles that are in the vicinity. This alert is usually a warning that you will have to pull over to let an emergency vehicle such as an ambulance pass. However, it will also alert you to the presence of road hazards (such as car accidents, if there are emergency vehicles on the scene) and railroad crossings. The Cobra ESD 7570 9-Band may have a number of brilliant features, but there are certain disadvantages to owning this unit that you should know about. For starters, the audio alerts are wonderful, and they do a good job of letting you know ahead of time that you should stay alert for the next couple of minutes. However, if you dare press the mute button, that will be the last you will hear of those alerts until you remember to press the button again. Moreover, if you are driving in the city, you will have numerous reasons to press the button. The fact that many city buildings emit some form of X or K band wave, means that the ESD 7570 9-Band is always giving you false alarms when in populated areas. Additionally, the lack of vocal alerts means that you will always be looking down at your dashboard or your windscreen when it beeps to find out what sort of alert you are receiving, which can be dangerous, especially when driving at highway speeds. Another problem is that the suction cups that come with the device do not provide much suction, and many of these devices end up falling off the windshield. Many of the people who have purchased this device off Amazon.com have also bought a dashboard or windshield mount for this reason. The Cobra ESD7570 9-Band Radar/Laser detector is one of the most useful detectors you can get right now. Laser detection may not be the best, but the same can be said for almost ANY laser detector that is on the market right now. The same is true when it comes to false alarms, though this may be slightly higher up on the scale. However, as the old adage goes, you get what you pay for. However, with this device you could argue that you get slightly more. At Currently Not Available*, it is an absolute bargain, and the additional around $10 for a mounting bracket (to make sure it stays on your windshield) is not too much to ask, especially with the invisibility that it provides when confronted with police using RDDs. Overall this is a good device that you should seriously consider buying as it will give you the confidence to drive down the highway without fear of being stopped by law enforcement.